NFL quarterback Tom Brady is both loved and hated by millions. The suspicious activities by both him and his team have lead to cheating allegations for years, but this pales in caparison to his possible biggest character flaw. In the Illuminati controlled world in which we live, when you reach a certain level of success similar to that of Tom Brady you are down with the program plain and simple. Either that or you are not Tom Brady of the New England Patriots married to a super model. You are one of the thousands of guys named Tom Brady in the USA watching the game at home. 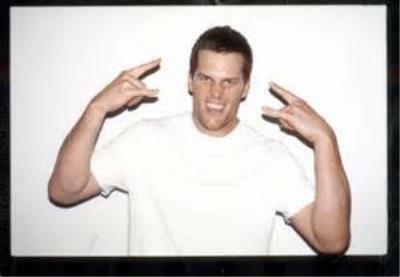 As from the photos above Tom does all the standard Illuminati symbolism as does his wife model Gisele Bundchen. 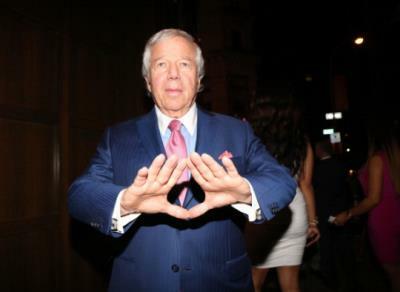 Even the owner of the Patriots Robert Kraft is throwing up the pyramid - no wonder they win so much. Indeed inflate-gate is a misdemeanor in comparison to succumbing to the dark side.